Mid to late summer. Long blooming. Vigorous and easy. Divide every third year or so to keep plants vigorous. 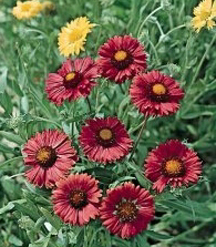 Gaillardias are wonderfully colorful plants with daisy-like flowers in shades ranging from yellow to maroon. They enjoy a long bloom period from midsummer right up until frost and are very drought tolerant. The Monarch strain reaches a height of 30 inches and comes in a wide range of colors. Burgundy is very similar in form but shades of maroon and burgundy predominate. Both make fine cut flowers. Goblin is a dwarf form reaching 8 to 12 inches. It is an excellent front of the border plant for dry sunny locations. Gaillardias are very attractive in mass and are a butterfly favorite. Gaillardias will self sow readily. Though they do not always come true, volunteer plants are often very interesting and come in a wide range of colors. New plants should be spaced 12 to 18 inches apart. Divide established plants every few years to keep them vigorous.